WordPress.com is a free service. If downloading, installing, and using software on a web server sound like Greek to you and are chores you’d rather avoid, the WordPress folks provide a solution for you at WordPress.com. WordPress.com is a hosted solution, which means it has no software requirement, no downloads, and no installation or server configurations. Everything’s done for you on the back end, behind the scenes. You don’t even have to worry about how the process happens; it happens quickly, and before you know it, you’re making your first blog post. Add a Domain: This upgrade allows you to add your own domain name to your WordPress.com account; see Book II, Chapter 1. This service costs $5.00 for the domain registration and $13.00 for the domain mapping. VideoPress: This upgrade equips you with the ability to upload, store, and share your videos from your WordPress.com account. This service covers the storage space that your video files take up on the WordPress.com servers. The service costs $60.00 per year. Custom Design: This upgrade lets you customize the fonts used on your site, change the color scheme, and customize the Cascading Style Sheet (CSS) for the theme you’re using in the WordPress.com system. It’s recommended for users who understand CSS. The cost is $30.00 per year. Space Upgrades: With the free WordPress.com blog, you have 5GB of hard drive space in your upload directory. The various space upgrades add more, letting you upload more files (images, videos, audio files, and so on). You can add 10GB for $20.00 per year, 25GB for $50.00 per year, 50GB for $90.00 per year, 100GB for $160.00 per year, and 200GB for $290.00 per year. No Ads: For $30.00 per year, you can ensure that your WordPress.com blog is ad free. Occasionally, WordPress.com does serve ads on your blog pages to defray the costs of running a popular service. If you’d rather not have those ads appearing on your blog, pay for the No Ads upgrade and you’ll be ad free! Site Redirect: Allows you to forward your WordPress.com URL to an offsite domain; this is helpful if you choose to move away from WordPress.com to your own domain with the WordPress.org software — you can forward the traffic that you have built for $13 per year. Premium Theme: Use a special handcrafted theme built exclusively for WordPress by community theme authors for $50.00 per theme. Guided Transfer: Have the folks at WordPress.com complete a transfer of your WordPress.com hosted website to a WordPress.org self-hosted installation on one of their hosting partner’s services. 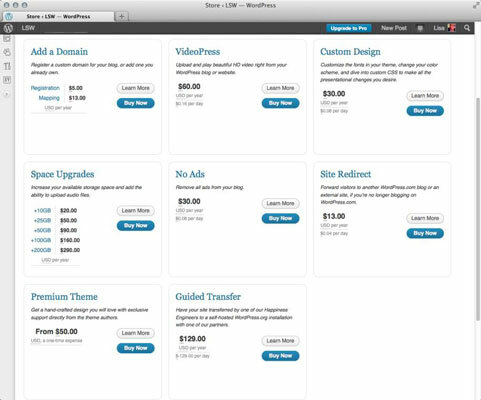 WordPress.com has some limitations; you cannot install plugins or custom themes, for example, and you cannot customize the base code files, nor are you able to sell advertising or monetize your blog on WordPress.com. But even with its limitations, WordPress.com is an excellent starting point if you’re brand new to blogging and a little intimidated by the configuration requirements of the self-installed WordPress.org software. The good news is that if you outgrow your WordPress.com-hosted blog and want to move to the self-hosted WordPress.org software, you can. 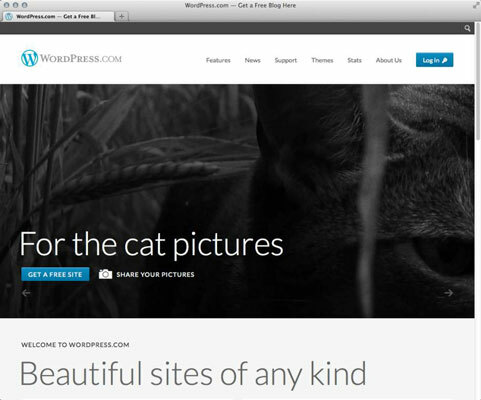 You can even take all the content from your WordPress.com-hosted blog with you and easily import it into your new setup with the WordPress.org software. Therefore, in the grand scheme of things, your options aren’t really that limited.